The objective of the group is to develop efficient strategies in mass spectrometry (MS)-based proteomics and structural MS to obtain new insights into protein function, regulation and dynamics. Our main projects include the analysis of protein complexes like the human proteasome and the characterization of inflammatory and immune processes using state-of-the-art MS instrumentation and dedicated bioinformatics tools. Proteomics represents a powerful approach for the understanding of complex biological systems. Despite considerable progress over the last decade, proteomics is still a rapidly evolving field. Mass spectrometry is a key technology in proteomic strategies offering various platforms with specific capabilities continuously improving in terms of sensitivity, mass resolution and acquisition speed. Major advances in proteomics can also be attributed to the optimization of biochemical protocols and analytical methods for sample preparation before data acquisition, and to the development of sophisticated bioinformatics software for efficient data analysis. Based on our expertise in mass spectrometry and proteomics, research projects are pursued to characterize several biological systems. We are interested in understanding the structure/activity relationships of human proteasome, a large multicatalytic complex in charge of intracellular protein degradation and a therapeutic target for some cancers. We developed integrated strategies using in-vivo crosslinking, affinity-purification and quantitative proteomics to characterize the diversity of proteasome complexes, their cellular distribution and their dynamics. We also developed large-scale quantitative proteomic analyses to understand the molecular mechanisms of the inflammatory and immune response of endothelial cells and of different populations of immune cells like regulatory T lymphocytes. The analysis of protein posttranslational modifications, like phosphorylation and glycosylation, represents another challenge we are addressing to decipher specific pathways. Cayrol C et al 2018 Environmental allergens induce allergic inflammation through proteolytic maturation of IL-33. Nat Immunol, 19, 375-385. Jonik-Nowak B et al 2018 PIP30/FAM192A is a novel regulator of the nuclear proteasome activator PA28γ. Proc Natl Acad Sci USA., 115, E6477-E6486. Parra J et al 2017 Scrutiny of Mycobacterium tuberculosis 19 kDa antigen proteoforms provides new insights in the lipoglycoprotein biogenesis paradigm. Sci Rep, 7, 43682. Duguet F et al 2017 Proteomic analysis of regulatory T cells reveals the importance of Themis1 in the control of their suppressive function. Mol Cell Proteomics, 16, 1416-1432. Fabre B et al 2015 Deciphering preferential interactions within supramolecular protein complexes: the proteasome case. Mol Syst Biol, 11, 771. State-of-the-art mass spectrometry equipment and bioinformatics resources for proteomics. Guillet V, Bordes P, Bon C, Marcoux J, Gervais V, Sala AJ, Dos Reis S, Slama N, Mares-Mejía I, Cirinesi AM, Maveyraud L, Genevaux P, Mourey L. (2019) Structural insights into chaperone addiction of toxin-antitoxin systems. Nat Commun. 10(1):782. Menneteau T, Fabre B, Garrigues L, Stella A, Zivkovic D, Roux-Dalvai F, Mouton-Barbosa E, Beau M, Renoud ML, Amalric F, Sensebe L, Gonzalez-de-Peredo A, Ader I, Burlet-Schiltz O, Bousquet MP. (2019) Mass spectrometry-based absolute quantification of 20S proteasome status for controlled ex-vivo expansion of Human Adipose-derived Mesenchymal Stromal/Stem Cells. Mol Cell Proteomics.pii: mcp.RA118.000958. Locard-Paulet M*, Parra J, Albigot R, Mouton-Barbosa E, Bardi L, Burlet-Schiltz O, Marcoux J. * (2019) VisioProt-MS: interactive 2D maps from intact protein mass spectrometry. Bioinformatics. 35(4):679-681. Lefebvre C, Boulon R, Ducoux M, Gavalda S, Laval F, Jamet S, Eynard N, Lemassu A, Cam K, Bousquet MP, Bardou F, Burlet-Schiltz O, Daffé M, Quémard A. (2018) HadD, a novel fatty acid synthase type II protein, is essential for alpha- and epoxy-mycolic acid biosynthesis and mycobacterial fitness. Sci Rep., 8, 6034. Gervais V, Muller I, Mari PO, Mourcet A, Movellan KT, Ramos P, Marcoux J, Guillet V, Javaid S, Burlet-Schiltz O, Czaplicki G, Milon A, Giglia-Mari G. (2018) Small molecule-based targeting of TTD-A dimerization to control TFIIH transcriptional activity represents a potential strategy for anticancer therapy. J Biol Chem., 293, 14974-14988. Gaud G, Roncagalli R, Chaoui K, Bernard I, Familiades J, Colacios C, Kassem S, Monsarrat B, Burlet-Schiltz O, Gonzalez de Peredo A, Malissen B, Saoudi A. (2018) The costimulatory molecule CD226 signals through VAV1 to amplify TCR signals and promote IL-17 production by CD4+ T cells. Sci Signal., 11, pii: eaar3083. Sbardella D, Tundo GR, Coletta A, Marcoux J, Koufogeorgou EI, Ciaccio C, Santoro AM, Milardi D, Grasso G, Cozza P, Bousquet-Dubouch MP, Marini S, Coletta M (2018) The insulin-degrading enzyme is an allosteric modulator of the 20S proteasome and a potential competitor of the 19S. Cellular and Molecular Life Science 75(18):3441-3456. Jonik-Nowak B#, Menneteau T#, Fesquet D, Baldin V, Bonne-Andrea C, Méchali F, Fabre B, Boisguerin P, de Rossi S, Henriquet C, Pugnière M, Ducoux-Petit M, Burlet-Schiltz O, Lamond AI, Fort P, Boulon S, Bousquet MP*, Coux O*. (2018) PIP30/FAM192A is a novel regulator of the nuclear proteasome activator PA28γ. Proc Natl Acad Sci U S A., 115, E6477-E6486. Cayrol C, Duval A, Schmitt P, Roga S, Camus M, Stella A, Burlet-Schiltz O, Gonzalez-de-Peredo A, Girard JP. (2018) Environmental allergens induce allergic inflammation through proteolytic maturation of IL-33. Nature Immunol, 19, 375-385. Matondo M, Marcellin M, Chaoui K, Bousquet-Dubouch MP, Gonzalez-de-Peredo A, Monsarrat B, Burlet-Schiltz O. (2017) Determination of differentially regulated proteins upon proteasome inhibition in AML cell lines by the combination of large-scale and targeted quantitative proteomics. Proteomics, 17, 1600089. D. Cheng, M. Deobagkar-Lele, E. Zvezdova, S. Choi, S. Uehara, D. Baup, S.C. Bennett, K.R. Bull, T.L. Crockford, H. Ferry, C. Warzecha, M. Marcellin, A. Gonzalez de Peredo, R.J. Cornall (2017) Themis2 lowers the threshold for B cell activation during positive selection. Nat. Immunol. doi:10.1038/ni.3642. S. Deota, T. Chattopadhyay, D. Ramachandran, E. Armstrong, B. Camacho, B. Maniyadath, A. Fulzele, A. Gonzalez-de-Peredo, J.M. Denu, U. Kolthur-Seetharam (2017) Identification of a Tissue-Restricted Isoform of SIRT1 Defines a Regulatory Domain that Encodes Specificity. Cell Rep. 18. doi:10.1016/j.celrep.2017.03.012. Vizcaíno JA, Walzer M, Jiménez RC, Bittremieux W, Bouyssié D, Carapito C, Corrales F, Ferro M, Heck AJR, Horvatovich P, Hubalek M, Lane L, Laukens K, Levander F, Lisacek F, Novak P, Palmblad M, Piovesan D, Pühler A, Schwämmle V, Valkenborg D, van Rijswijk M, Vondrasek J, Eisenacher M, Martens L, Kohlbacher O. (2017) A community proposal to integrate proteomics activities in ELIXIR. F1000Res. Jun 13;6. pii: ELIXIR-875. doi: 10.12688/f1000research.11751.1. eCollection 2017. Carel C#, Marcoux J#, Réat V, Parra J, Latgé G, Laval F, Demange P, Burlet-Schiltz O, Milon A, Daffé M, Tropis MG, Renault MA. (2017) Identification of specific posttranslational O-mycoloylations mediating protein targeting to the mycomembrane. Proc Natl Acad Sci U S A., 114, 4231-4236. Alonso H, Parra J, Malaga W, Payros D, Liu CF, Berrone C, Robert C, Meunier E, Burlet-Schiltz O, Rivière M, Guilhot C. (2017) Protein O-mannosylation deficiency increases LprG-associated lipoarabinomannan release by Mycobacterium tuberculosis and enhances the TLR2-associated inflammatory response. Sci Rep., 7, 7913. Chiaradia L, Lefebvre C, Parra J, Marcoux J, Burlet-Schiltz O, Etienne G, Tropis M, Daffé M. (2017) Dissecting the mycobacterial cell envelope and defining the composition of the native mycomembrane. Sci Rep., 7, 12807. Duguet F#, Locard-Paulet M#, Marcellin M, Chaoui K, Bernard I, Andreoletti O, Lesourne R, Burlet-Schiltz O, Gonzalez de Peredo A*, Saoudi A*. (2017) Proteomic analysis of regulatory T cells reveals the importance of Themis1 in the control of their suppressive function. Mol Cell Proteomics., 16, 1416-1432. Parra J#, Marcoux J#, Poncin I, Canaan S, Herrmann JL, Nigou J, Burlet-Schiltz O*, Rivière M*. (2017) Scrutiny of Mycobacterium tuberculosis 19 kDa antigen proteoforms provides new insights in the lipoglycoprotein biogenesis paradigm. Sci Rep., 7, 43682. Ramus C, Hovasse A, Marcellin M, Hesse AM, Mouton-Barbosa E, Bouyssié D, Vaca S, Carapito C, Chaoui K, Bruley C, Garin J, Cianférani S, Ferro M, Van Dorssaeler A, Burlet-Schiltz O, Schaeffer C, Couté Y, Gonzalez de Peredo A. (2016) Benchmarking quantitative label-free LC-MS data processing workflows using a complex spiked proteomic standard dataset. J Proteomics, 132, 51-62. Gautier V, Cayrol C, Farache D, Roga S, Monsarrat B, Burlet-Schiltz O, Gonzalez de Peredo A, Girard JP. (2016) Extracellular IL-33 cytokine, but not endogenous nuclear IL-33, regulates protein expression in endothelial cells. Sci Rep., 6, 34255. Lazar I, Clement E, Dauvillier S, Milhas D, Ducoux-Petit M, Le Gonidec S, Moro C, Soldan V, Dalle S, Balor S, Golzio M, Burlet-Schiltz O, Valet P, Muller C, Nieto L. (2016) Adipocyte exosomes promote melanoma aggressiveness through fatty acid oxidation: a novel mechanism linking obesity and cancer. Cancer Res., 76, 4051-7. Ramus C, Hovasse A, Marcellin M, Hesse AM, Mouton-Barbosa E, Bouyssié D, Vaca S, Carapito C, Chaoui K, Bruley C, Garin J, Cianférani S, Ferro M, Dorssaeler AV, Burlet-Schiltz O, Schaeffer C, Couté Y, Gonzalez de Peredo A. (2016) Spiked proteomic standard dataset for testing label-free quantitative software and statistical methods. Data Brief. 2015, 6, 286-94. eCollection 2016 Mar. Zvezdova E, Mikolajczak J, Garreau A, Marcellin M, Rigal L, Lee J, Choi S, Blaize G, Argenty J, Familiades J, Li L, Gonzalez de Peredo A, Burlet-Schiltz O, Love PE, Lesourne R. (2016) Themis1 enhances T cell receptor signaling during thymocyte development by promoting Vav1 activity and Grb2 stability. Sci Signal., 9, 51. N. Socoro-Yuste, M.-C. Dagher, A. Gonzalez De Peredo, J. Mondet, A. Zaccaria, F. Roux Dalvai, I. Plo, J.Y. Cahn, P. Mossuz (2016) Ph−myeloproliferative neoplasm red blood cells display deregulation of IQGAP1-Rho GTPase signaling depending on CALR/JAK2 status. Biochim. Biophys. Acta - Mol. Cell Res. 1863. doi:10.1016/j.bbamcr.2016.08.012. Voisinne G, García-Blesa A, Chaoui K, Fiore F, Bergot E, Girard L, Malissen M, Burlet-Schiltz O, Gonzalez de Peredo A, Malissen B, Roncagalli R. (2016) Co-recruitment analysis of the CBL and CBLB signalosomes in primary T cells identifies CD5 as a key regulator of TCR-induced ubiquitylation. Mol Syst Biol., 12, 876. Vandenbrouck Y, Lane L, Carapito C, Duek P, Rondel K, Bruley C, Macron C, Gonzalez de Peredo A, Couté Y, Chaoui K, Com E, Gateau A, Hesse AM, Marcellin M, Mear L, Mouton-Barbosa E, Robin T, Burlet-Schiltz O, Cianférani S, Ferro M, Freour T, Lindskog C, Garin J, Pineau C. (2016) Looking for missing proteins in the proteome of human spermatozoa: an update. J Proteome Res., 15, 3998-4019. Fabre B., Lambour T., Garrigues L, Amalric F., Vigneron N., Menneteau T., Stella A., Monsarrat B., Van den Eynde B., Burlet-Schiltz O. *, Bousquet-Dubouch M.P. * (2015) Deciphering preferential interactions within supramolecular protein complexes: the proteasome case. Mol. Syst. Biol., 11, 771. Bouyssié D, Dubois M, Nasso S, Gonzalez de Peredo A, Burlet-Schiltz O, Aebersold R, Monsarrat B* (2015) mzDB: a file format using multiple indexing strategies for the efficient analysis of large LC-MS/MS and SWATH-MS datasets. Mol Cell Proteomics, 14, 771-81. Duluc C, Moatassim-Billah S, Chalabi-Dchar M, Perraud A, Samain R, Breibach F, Gayral M, Cordelier P, Delisle MB, Bousquet-Dubouch MP, Tomasini R, Schmid H, Mathonnet M, Pyronnet S, Martineau Y, Bousquet C. (2015) Pharmacological Targeting Of The Protein Synthesis Mtor/4e-Bp1 Pathway In Cancer-Associated Fibroblasts Abrogates Pancreatic Tumour Chemoresistance. Embo Mol Med. 7(6):735-53. Carapito C, Lane L, Benama M, Opsomer A, Mouton-Barbosa E, Garrigues L, Gonzalez de Peredo A, Burel A, Bruley C, Gateau A, Bouyssié D, Jaquinod M, Cianferani S, Burlet-Schiltz O, Van Dorsselaer A, Garin J, Vandenbrouck Y. (2015) Computational and Mass-Spectrometry-Based Workflow for the Discovery and Validation of Missing Human Proteins: Application to Chromosomes 2 and 14. J Proteome Res., 14, 3621-34. Reginald K, Chaoui K, Roncagalli R, Beau M, Goncalves Menoita M, Monsarrat B, Burlet-Schiltz O, Malissen M, Gonzalez de Peredo A, Malissen B. (2015) Revisiting the Timing of Action of the PAG Adaptor Using Quantitative Proteomics Analysis of Primary T Cells. J Immunol., 195, 5472-81. Lazar I, Clement E, Ducoux-Petit M, Denat L, Soldan V, Dauvillier S, Balor S, Burlet-Schiltz O, Larue L, Muller C, Nieto L. (2015) Proteome characterization of melanoma exosomes reveals a specific signature for metastatic cell lines. Pigment Cell Melanoma Res., 28, 464-75. Fabre B#, Lambour T#, Bouyssié D, Menneteau T, Monsarrat B, Burlet-Schiltz O*, Bousquet-Dubouch MP* (2014) Comparison of label-free quantification methods for the determination of protein complexes subunits stoichiometry. EuPA Open Proteomics, 4, 82-86. Martinez-Pinna R, Gonzalez de Peredo A, Monsarrat B, Burlet-Schiltz O, Martin-Ventura JL* (2014) Label-free quantitative proteomic analysis of human plasma-derived microvesicles to find protein signatures of abdominal aortic aneurysms. Proteomics Clin Appl., 8, 620-5. Lacroix C, Caubet C, Gonzalez-de-Peredo A, Breuil B, Bouyssie D, Stella A, Garrigues L, Le Gall C, Raevel A, Massoubre A, Klein J, Decramer S, Sabourdy F, Bandin F, Burlet-Schiltz O, Monsarrat B, Schanstra JP, Bascands JL* (2014) Label-free quantitative urinary proteomics identifies the arginase pathway as a new player in congenital obstructive nephropathy. Mol Cell Proteomics, 13, 3421-34. Martineau Y, Wang X, Alain T, Petroulakis E, Shahbazian D, Fabre B, Bousquet-Dubouch MP, Monsarrat B, Pyronnet S, Sonenberg N. (2014) Control Of Paip1-Eukayrotic Translation Initiation Factor 3 Interaction By Amino Acids Through S6 Kinase. Mol Cell Biol. 34(6):1046-1053. Based on its expertise in the field of mass spectrometry and proteomics and using up-to-date mass spectrometry instrumentation, the Proteomics Infrastructure of Toulouse proposes state-of-the-art proteomics analyses to the academic and industrial scientific communities. This structure has received the national IBiSA label and has been certified ISO 9001 since 2006 and NF X 50-900 since 2014. 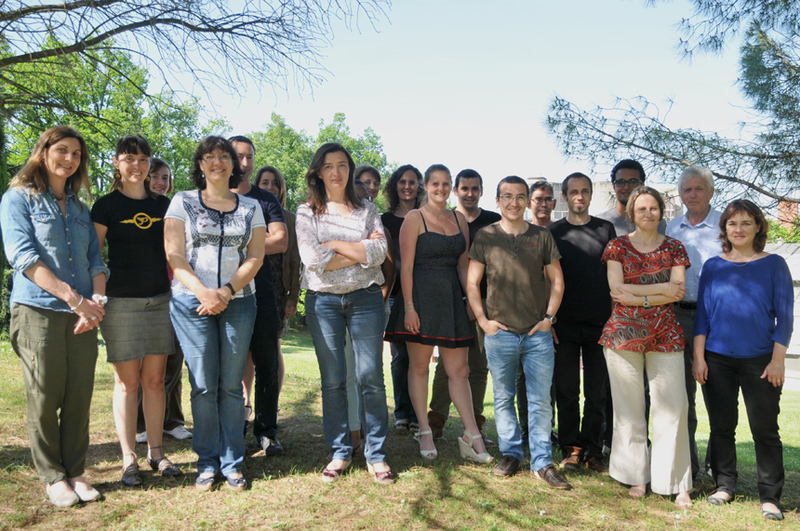 In 2011, the French Proteomics Infrastructure (ProFI), which gathers the Toulouse, Grenoble and Strasbourg Proteomics Infrastructures, has been created to increase human resources and competitiveness in proteomics in France.